An existing Mountain Water System customer in Asheville knew it was time for an upgraded water filtration system. The water seemed hard, and there was discoloration. We tested the water and gave our recommendations. They also wanted to make sure the water didn’t have any odd odors or tastes that it has now! They choose the best combination of water filtration system available today for homes and businesses. 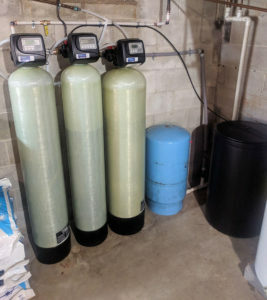 We installed our American Made iron filter for the rust-colored staining, and our best seller water softener for hard water and a carbon filter to make sure that water straight from the tap tastes great!